Last week, during the first ever press meet for his ambitious multi-starrer, RRR, director Rajamouli said that RRR will be the common title for the film’s Telugu, Tamil and Hindi versions. Rajamouli also said that the film’s unit will consider if fans suggest some good titles for all the versions. 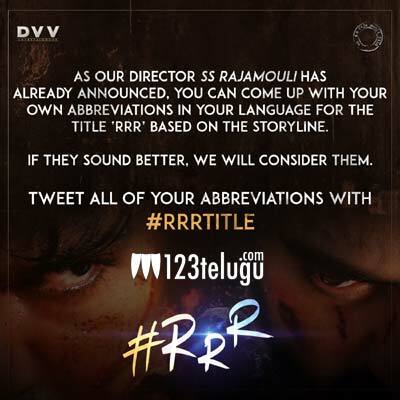 Since then, social media has been abuzz with the hashtag #RRRTitle, with fans from across the world coming up with interesting title expansions for the acronym, RRR. ‘Rama Rajula Ranam’, ‘Rana Ranga Rarajulu’, ‘Raghupati Raghava Rajaram’ ‘Roudra Ranarangam’ and ‘Rama Rajula Rajasam’ etc are some of the interesting titles suggested by fans for the Telugu version. Buoyed by the response, the makers encouraged all the enthusiasts fans to come up with more exciting titles. Well, talk about clever promotions!